Trying to get two children to nap simultaneously is a bit like herding cats. How’s your day? 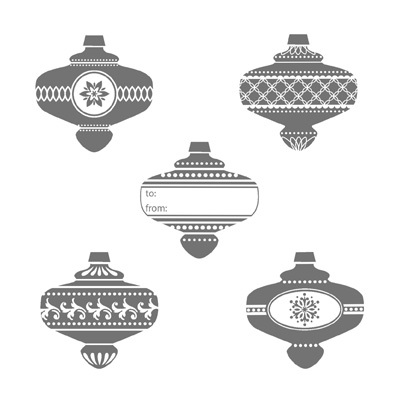 I’ve had the Christmas Collectibles stamp set for a few weeks now and have tried to use it five or six times. But for some reason, I couldn’t make it work. Don’t you hate that? But I was determined last night that it would work. I grabbed the sketch from Mojo Monday, though I changed it up a little (translation: I forgot to add the ribbon). Whenever I’m stumped on what to make, the first thing I do is look for a sketch. Once I have a sketch, I can stick strictly to it, or I can change it up however I want. Turn it on its side, turn it upside down, remove elements, add elements. I use them as guides, but I don’t let them dictate everything, so I still get to be creative. After I stamped then punched the ornaments with the Christmas Ornament punch, I wanted to glitter up the ornaments because I unapologetically heart glitter, but my toddler left the lid off my precision craft glue (and I failed to make sure that the lid got back on), and my new bottle of Multi glue won’t arrive until tomorrow’s Stampin’ Up! delivery gets here. So, sans a loose glitter option, I went with what I consider to be the better option anyway: mess-free Glimmer Paper (silver is shown here, and it also comes in red and champagne). I only added a little bit, because my card was already full enough, and I didn’t want to send it into overdone territory. The designer papers you see are both from the Season of Style paper. 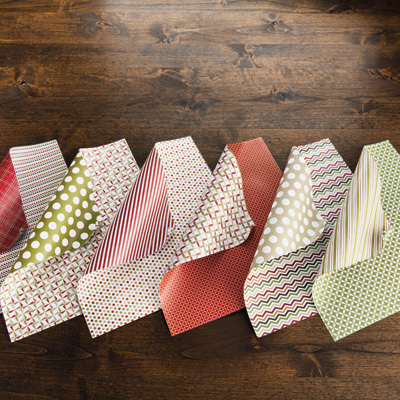 I love this paper because it is so easy to incorporate, no matter what your papercrafting style is. Bright, clean, cute, fun, busy, collage, vintage… You can probably even get grungy with it. I love the current trend of putting tags on cards. 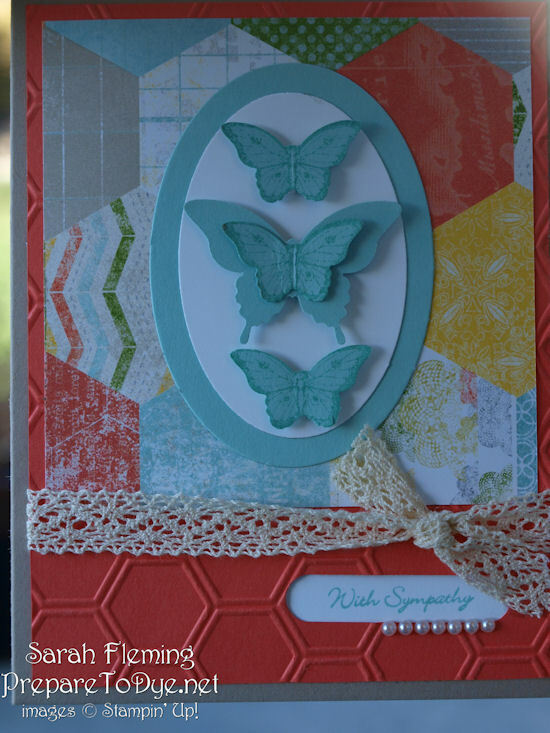 Here I used the two largest tags from the Chalk Talk framelits and even embossed the smaller one with the Chevron embossing folder. It just adds a little oomph. And there’s my new favorite ribbon, tied to the tag. The Cherry Cobbler Chevron ribbon is just fantastic. I didn’t tie the ribbon itself but rather tied it off using a piece of linen thread and a piece of Cherry Cobbler Baker’s Twine, which I tied and then knotted together. The sentiment is from my favorite new sentiment set in the Holiday Catalog, A Banner Christmas. I hope you like my card. I had fun making it, and I’m really pleased with how it turned out. Check out my Promotions page to see the great promotions going on now, including two months of Paper Pumpkin for half price if you sign up by August 31. 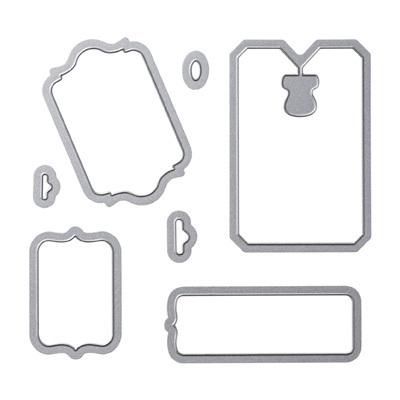 You’ll also notice the new Thinlits card dies — I will be showing you some sample projects using these dies starting Friday. Mine arrive tomorrow, and I can’t wait to play with them! 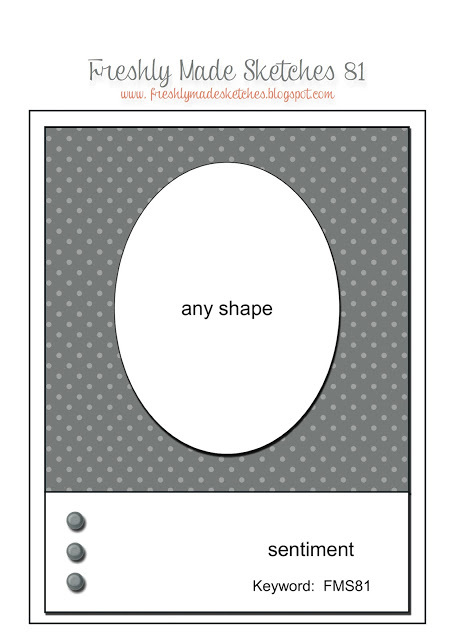 Find these and other great products at my online Stampin’ Up! store! 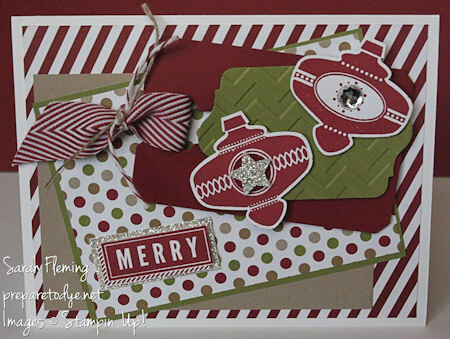 This card is full of sneak peeks from the holiday catalog, which goes live August 1st. I’m in love with the new chevron ribbon in the annual catalog and already have it in my two favorite colors, Cherry Cobbler and Island Indigo. 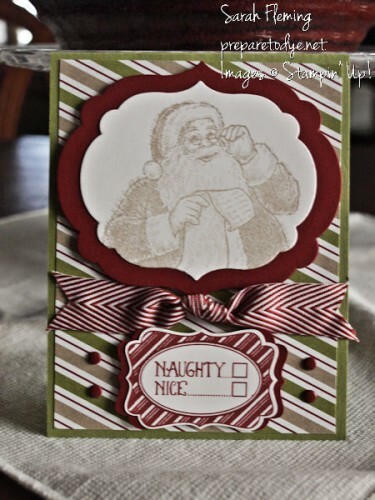 The Naughty/Nice stamp is also new, from the Very Merry Tags set in the holiday catalog. I haven’t checked either box yet, as Santa’s answer will depend on who receives the card. Do you love those Cherry Cobbler Candy Dots on either side of the tag? I do, and I LOVE that they come in all of our main colors. You can also build them into brads, but I think they’re great by themselves. Before I go, I want to share a great promotion with you. My Paper Pumpkin is Stampin’ Up!’s surprise-kit-of-the-month subscription — usually, you subscribe for $19.95/month (US), which includes shipping. The first month, you receive the Welcome kit, which has a clear block for mounting all of your future Paper Pumpkin stamps, plus the cardstock, ink, stamps, stickers, and buttons for creating 4 cards (this is the kit shown when you subscribe). Each month after that, you receive a surprise kit in the mail, and from what I’ve seen, the kits keep getting better every month! Now for the deal. If you sign up before August 31st, you get your first two months of Paper Pumpkin (the Welcome kit is your first month) for $10 each! And the best part about this subscription deal is that you can cancel at any time or even skip a month by updating your subscription. Pretty good, right? Here’s the link to sign up — make sure you enter promo code PUMPKINDEAL and that you also select me, Sarah Fleming (Idaho), as your demonstrator. Part of the card is cut off because it was so windy in Boise today that I had to actually hold the card in order to get a picture. Plus I’m a crafter, not a photographer. I got a new SU! shipment yesterday and wanted so badly to play with my new Epic Day DSP (love love LOVE this paper) last night, and the colors seemed to lend themselves to a sympathy card, so I went that direction. I used this week’s Freshly Made Sketches sketch for inspiration. I also forced myself to use two of my least favorite colors in great quantity in hopes that they will start to grow on me — Crumb Cake and Calypso Coral. I love to layer the Bitty Butterfly punch with the Elegant Butterfly punch, so I did that here and also layered two of the Ovals Collection framelits (also a new arrival for me yesterday). For finishing touches, I went with the Crochet Trim ribbon and a strip of Basic Pearls. Visit my Stampin’ Up! store to find these and other great products!